The classic French ratatouille is a dish where vegetables shine. Becca's simplified recipe is less hands-on than normal but doesn't compromise on flavour. Ratatouille is a dish I make fairly often. I've made it on the hob, and in the oven, but never in the slow cooker! Now that I've discovered this method, I don't think I'll ever go back to my old ways! 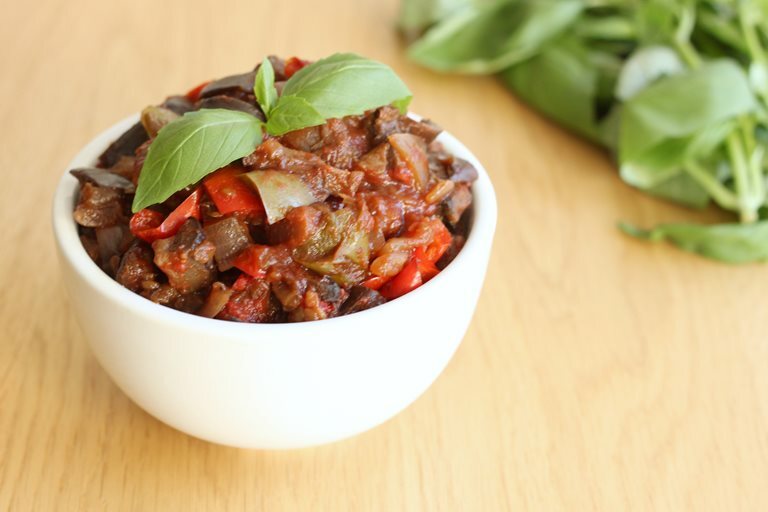 Making ratatouille in the slow cooker is beneficial for a few reasons. Firstly, it's super quick to prepare. Unfortunately, ratatouille will always involve a bit of chopping, but when you use your slow cooker, that's all there is for preparation - no stirring, no checking every five minutes... just throw it all in and wait. Secondly, this method is healthier than the other methods because you don't need to use any oil, which you do need when frying or roasting your vegetables. I did wonder whether the slow cooker would make the ratatouille less flavourful than usual, since you don't get the crispy bits around the edges like you do with roasted vegetables. However, I couldn't have been more wrong - cooking the veg low and slow made them unbelievably flavourful, and just a spoonful of tomato puree makes the sauce amazingly rich. The vegetables also stay really soft and juicy. You can use your ratatouille in any number of ways. I served mine on a baked sweet potato, but you could also stir it through pasta, serve it in an omelette, or make a ratatouille tart - or a million other dishes!